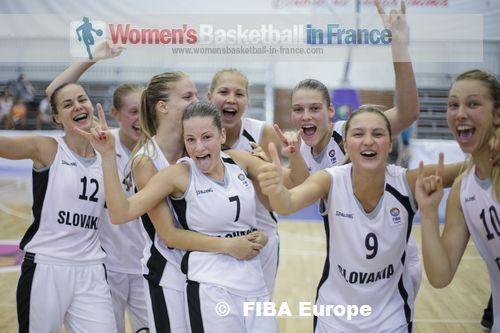 In the first day of qualifying round action at the FIBA Europe U18 European Championship for Women Division A, France and Turkey from Group E have secured a place in the quarter-final. In the relegation Group Belgium hold off Poland (49-43) while the Czech Republic beat hosts Romania (85-73). Olivia Epoupa was in fine form for France in their victory against Greece (64-42). She scored 10 points, dished out 5 assists and pulled down 8 rebounds. France took hold of the game early and never trailed in this match. With a double-digit advantage (19-9) by the end of the first quarter, France were able to rotate players frequently for the remaining three quarters. Mamignan Touré from France was the leading scorer of this match with 16 points while Styliani Fouraki was the only player in double digits for Greece with 12 points. Turkey were pushed all the way by Sweden and had to work hard for their (60-58) victory. Pelin Bilgic who led the way with 21 points put Turkey in front for good with 55 seconds to play. In the final game from Group E, Spain rolled over Russia (92-66). Leticia Romero with 17 points and 5 steals was the best player for Spain. You can watch the highlights video from Day 4 which shows Group E match Turkey vs. Sweden and all the games from Group F.
Group F has been blown wide open with the Netherlands and Italy suffering defeats. The Netherlands could not cope with the heat and allowed a 14-point advantage (46-32) from the third quarter against Slovenia evaporate. Slovenia did not panic in the final quarter and ran over the Netherlands 20-5 to win the match (57-51). Alina Gjerkes was the game leading scorer with 12 points while Laura Cornelius finished with 11 points for the Netherlands. The Slovak Republic snapped their two-game losing streak with an important victory against Italy (59-54). Terézia Páleníková was everywhere for the Slovak Republic scoring 14 points, dishing out 3 assists and making 3 steals. Serbia put together a 21-7 third-quarter run against Croatia which enabled them to win the match (75-63). Aleksandra Stanacev's 19 points and 8 assists gave Serbia the edge in this match. All six teams in Group F still have a chance of qualifying for the quarter-final.